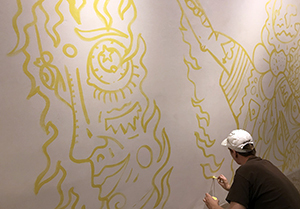 Join us Thursday, April 18, 5:30-7:00 p.m., to meet the artists and see them at work on their murals at our Artists Reception. Three Fort Collins Artists, Mike McPuff (shown left), Jennie C. Milner (above right), and Werner Schreiber (above left), will paint large-scale murals ON the gallery walls. For the first portion of the exhibit, the artists will be working onsite to paint their murals, stop by and see each artist’s unique approach to large-scale painting. Later in April, the murals will be complete, and visitors are invited to explore the of 1,300 square feet of finished murals. Fort Collins based painter and visual artist Mike McPuff has been focusing on murals for the last several years. His media of choice is acrylic paint for indoor projects, and spray paint for larger outdoor projects. Originally inspired by the DIY, "Do It Yourself" mentality of his peers, McPuff began to focus on creating a career as a visual artist, around 2013. The style McPuff developed over the years, engages the viewer with whimsical, yet surreal concepts, and a kaleidoscopic array of colors. In 2014, McPuff began to use digital software to create art, which quickly lead to his art appearing on television and the front of a well-known magazine. Jennie C. Milner has lived in Fort Collins since 1991. She is an East High School Denver graduate and Colorado State University Alumni, has hiked Horsetooth Trail over 20 times, ridden her bike approximately 27,000 miles, raised two teenage girls, tamed more than a few pound dogs, painted at The Denver Art Museum, Google, Arvada Center for the Arts and Humanities, Artworks Loveland, and more. She was recently the President of the Colorado Metalsmithing Association and maintains her metalsmithing/painting studio in Loveland, Colorado at Artworks Loveland. Painting for over 40 years, and using many mediums and techniques, Werner Schreiber loves painting! His work ranges from large scale murals to commercial window painting, and fine art. He has created many murals around Fort Collins and in Northern Colorado. Traveling throughout the country, landscapes and colorful skies have always played an important role. He likes to paint subjects that involve the study of shadows and light, colors and blending, which can shape the work, and helps bring imaginative impact into his painting.